Life Trustee Pete Kulynych and his family. Life Trustee Petro “Pete” Kulynych was honored for his 40 years of service to Wake Forest by the University’s board of trustees during the board’s meeting Feb. 3. 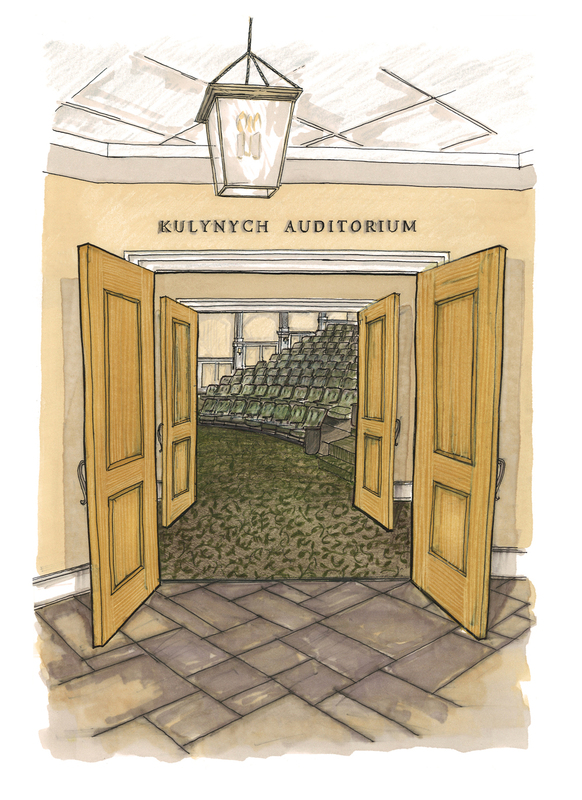 At the same meeting, Kulynych’s daughter, Janice K. Story (’75), a current member of the board of trustees, announced a major gift to the University to name the auditorium in the new Admissions and Welcome Center in honor of her father. The new admissions building is scheduled to open next month. 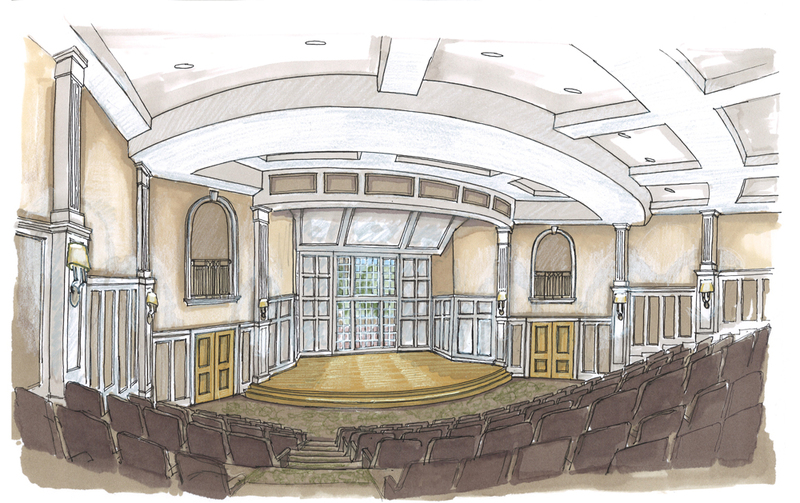 The 260-seat auditorium will be used for presentations to prospective students and their parents, as well as lectures, performances and other campus activities. 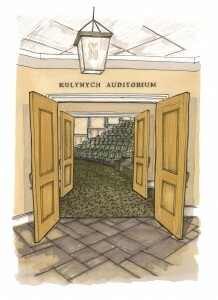 An artist's rendering of Kulynych Auditorium. “It is a pleasure to honor Pete Kulynych,” said President Nathan O. Hatch. “His name has become one of the most recognizable among Wake Forest philanthropists, but he is also a dear friend and wise counselor who has lived a life in the spirit of Pro Humanitate. Kulynych, 89, who lives in Wilkesboro, N.C., is a retired founding director emeritus of Lowes Companies, Inc. He first became involved with Wake Forest in the mid-1970s when he served as chairman of the Parents’ Association. He was elected to the board of trustees in 1976 and served four terms on the board before being named a Life Trustee in 1995. He also served on the Medical Center board of visitors. He received an honorary degree from Wake Forest in 1997. Janice Story lives in Atlanta, Ga. Kulynych’s other daughter, Brenda Cline, is a past member of the Medical Center’s board of directors. She and her husband, Dale (MBA ’76), have two children who graduated from Wake Forest, Luke Cline (’99) and Laura C. Berry (’94). Another rendering of Kulynych Auditorium. 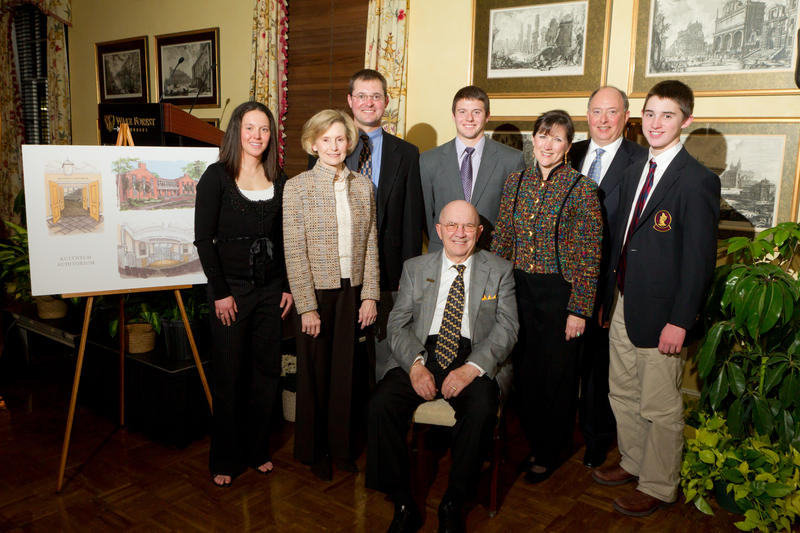 Kulynych has made numerous gifts to the University and endowed several scholarships, including the Roena B. and Petro Kulynych Scholarship for undergraduates from Avery and Wilkes counties, N.C.; the Janice Kulynych Story Tennis Scholarship for a member of the women’s tennis team, and most recently, with Janice Story’s family, the Kulynych-Story Family Fund for students who are the first in their family to attend college. He has also funded the Kulynych Faculty Support Fund. He also has generously supported the Medical Center, including funding for the Roena Kulynych Center for Memory and Cognition Research, named in memory of his late wife. He has also funded research in cardiology, interdisciplinary cancer research, leukemia, urology and other areas. The son of Ukrainian immigrants, Kulynych grew up in modest circumstances in Pennsylvania. After graduating from high school in 1939, he joined the Civilian Conservation Corps as it built the Blue Ridge Parkway. In 1942, he received an appointment to the Merchant Marine Academy and served as an engineer on ships in the Atlantic and Pacific theatres. He settled in Wilkesboro, N.C., in the mid-1940s and became a bookkeeper for a small hardware store that he helped grow into Lowes Co., with more than 1,700 stores across the country. Kulynych retired from day-to-day management of the company in 1983, but he remained with the company as president and chairman of Lowe’s Charitable and Educational Foundation, guiding the company’s philanthropic philosophy and activities. 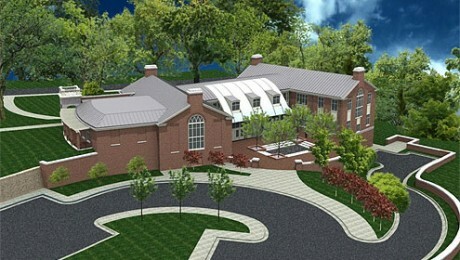 In addition to Wake Forest, Kulynych has supported numerous other organizations. In 1998, Kulynych and his wife were named North Carolina Philanthropists of the Year.